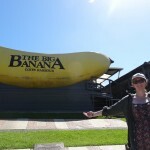 From all the things I have read about Coffs Harbour prior to coming it, the one thing that intrigued me the most was the Big Banana. For some strange reason Australia likes to put big things in the oddest of places. The Big Banana wasn’t that great, intact the less said about it the better, it did have another toboggan run tho. 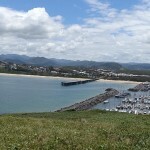 Moving on from the Big Banana, Coffs Harbour is actually a really beautiful place. Between may and october you can see many kinds of whales here as the cross the Tasman Sea on their migration south. Unfortunately we’re in January, so there are non around at the moment. The views were stunning all the same.